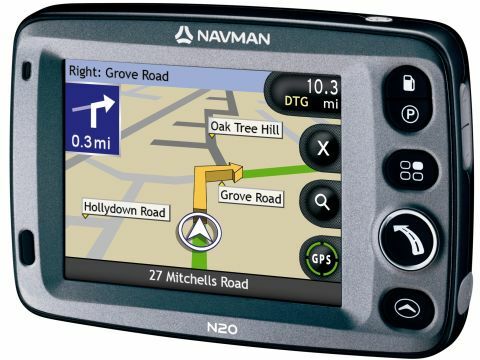 The N20 (£250 inc. VAT) is a mid-range satnav device from Navman. Although it comes with a reasonable price, it's far from stripped of features. At just 23mm in depth and with rounded edges, the N20 slips comfortably into small bags and coat pockets. The design is simple, finished in hard-wearing grey plastic, with chrome touches. A 3.5-inch touch screen is in place, and addresses or full eight-digit postcodes are entered using an onscreen Qwerty keyboard. You'll also find a number of useful hardware buttons, offering volume, a return to the main menu, and a nearest petrol station and parking search. The N20 comes with directions for 21 European countries pre-installed. There's 64MB of system memory, and maps are stored on 512MB of flash-based ROM. The maps are clear, bright and easy to use, with a night mode included. You'll find NavPix technology in place, allowing you to download photographs of famous landmarks and destinations from www.navman.com. A SiRF Star III GPS module is at the heart of the device, offering the most up-to-date technology possible. We found satellites were located quickly, and the signal remained consistent. Directions turned out to be accurate, and the N20 was quick to react if we strayed off the route. An extensive points-of-interest list makes it easy to find anything you need on the way. Offering plenty for your money, the Navman N20 is one of the best mid-range GPS devices we've seen. Usability is second to none, and the amount of features belies its price.